Are you ready to truly take control of your skin and put your acne in the past? 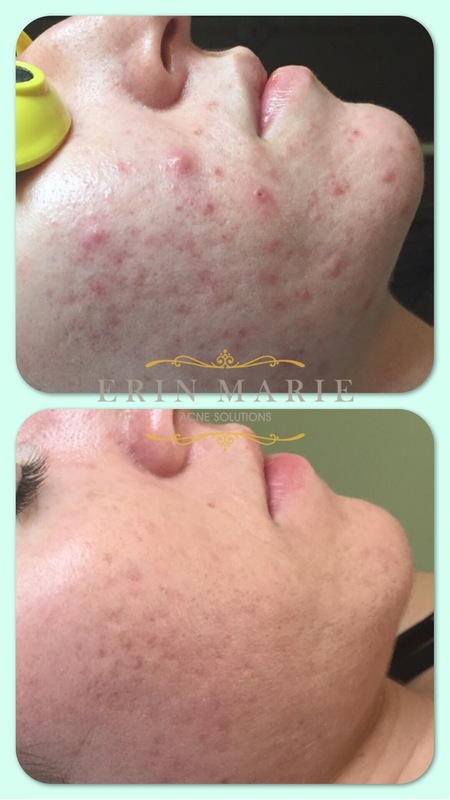 If you are new to Erin Marie Acne Solutions, the consultation is your first step to clear skin! The Clear Skin Program begins with a thorough review of your acne history, medical history and lifestyle, followed by an extensive educational session where we will identify the possible causes/aggravators of your acne and teach your how to correct them. Then, I will perform a skin assessment and sensitivity test. Based on those results, we will develop a treatment plan + regimen tailored for your skin and acne type. You will go home with all of the instructions and tools you need to achieve clear skin. At the end of your consultation, you will be given a treatment plan and home care products. Expect to pay around $100-$140 for your complete home care regimen. Many of these products will last for 6-8 weeks or longer. However you may be asked to change or alter your home care a couple of times throughout the Program, and to refill your products as you run out. Individual product costs range from $9 to $38. I also offer 100% acne-safe hair and makeup products. These range from $6-$32. Together we will create an individualized treatment plan with your goals and budget in mind. This will include in-studio visits every 2-3 weeks until your skin clears, which can be anywhere from 3-6 months and largely depends on how committed you are to following a daily homecare routine, living an acne-safe lifestyle and how regularly you come in for treatments. At each visit, based upon the treatment plan that we have created at your consultation, we will adjust your homecare regimen as your skin progresses, provide support on your acne-safe lifestyle changes and treat your skin. By having an acne treatment every 2-3 weeks during the clearing process, I can extract acne lesions as they surface. This will help your skin clear MUCH faster. For acne clients who are currently in the Clear Skin Program. Experience faster clearing when you come in with a clean face and relax under healing LED light for 30 minutes as often as your schedule allows. Subject to availability. Keep following your homecare and lifestyle recommendations! Once your acne is under control, it's critical that you continue following an acne-safe lifestyle and your daily skincare regimen to keep your skin clear and healthy. Some clients may do fine without follow-up treatments while others with more active, oily skin or other imbalances may need to continue getting treatments to maintain clearance. On average, quarterly visits to maintain your results and make seasonal adjustments to your homecare will do the trick! The Clear Skin Program is called a program for a reason. Anything worth doing requires commitment, and this is no different. As passionate as I am about clearing your skin, I can't do it alone or do it for you. Clients who are successful in the Clear Skin Program are the ones who are serious about following the program exactly as I outline and commit to taking action daily. This program is designed for those who are serious about getting their acne under control and diminishing it for good. There is no cure for acne, but it can be successfully managed with the proper home care regimen and your patience and commitment! 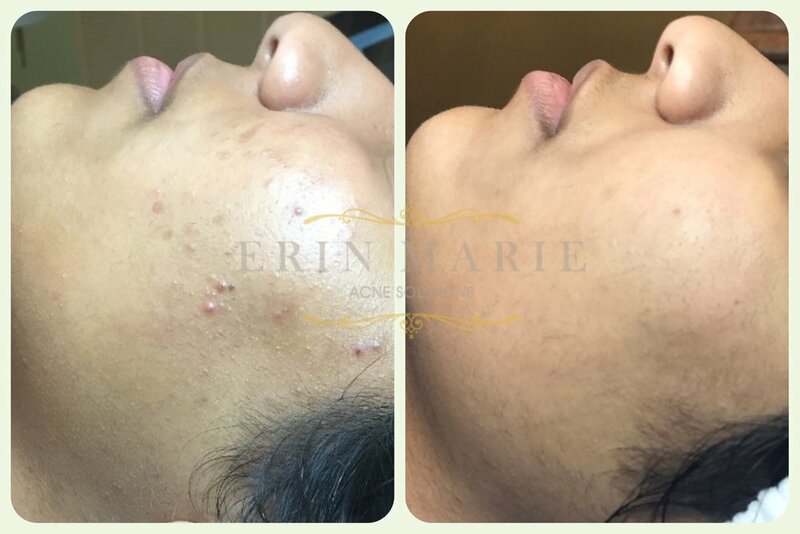 For best results, I see clients for a 45-90 minute treatment every 2-3 weeks, until the acne is under control – which is an average of 3-4 months. After that, maintenance appointments are recommended for continued clearing at intervals of 4 weeks, 6 weeks, 8 weeks and so on. As the skin clears, the time in between treatments lengthens. After acne treatments, you may experience peeling, redness, or light scabbing but these post-treatment side-effects are temporary and usually go away within 2-5 days. As your skin clears, skin recovery time is shortened. A special event the day of (or up to a week following) your appointment is not recommended, so be sure to plan accordingly. The Clear Skin Program success rate is very high – about 90-95%. This is largely depends on your commitment to the acne-safe lifestyle, skin care regimen and regular treatments, The average client sees significant improvement after 3 months, and continued clearing from there. If the skin is slow to heal, purge, or if there is a systemic issue present, the time it takes to clear may be longer, more like 6 months, or until the systemic issues are addressed. If I feel your case is going to take longer, or be more complicated, I will advise you of this as soon as possible, and be honest to whether or not I can help you and if so, how much I can help.